1X8 HDMI 2.0 splitter 4K This 1x8 HDMI Splitter uses a single HDMI source, accessing to multiple HDMI sinks. .. 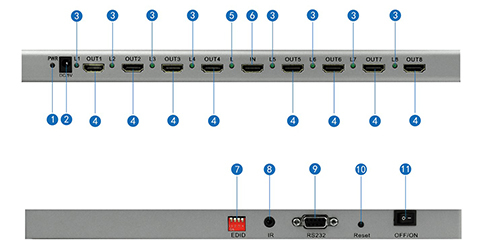 This 1x8 HDMI Splitter uses a single HDMI source, accessing to multiple HDMI sinks. It allows one HDMI device to be split easily to eight HDMI compatible monitors or projectors. In addition，it can be placed at the end of a long HDMI cable to regenerate the HDMI signal. The resolution of this hdmi splitter can be up to 3840X2160/60Hz. This splitter supports EDID management function, comes with eight kinds of EDID mode, the users can choose according to their own needs. In addition, this product is also built-in IR extension function, can work with our hdmi 2.0 repeater which has IR-RX receiving the IR command to control the source. Support one single HDMI source，accessing to multiple HDMI sinks, the source can be DVD player, A/V receiver, set top box and etc. *Working Mode Description： There are two working mode for product, normal operating mode and upgrade mode, which is decided by DIP EDID switch 1, 1 is upgrade mode，0 is normal operating mode. *IR extension description: There is an IR TX Extension port, it can work with an optional HDMI 2.0 repeater which works as IR-RX and IR extended via HDMI cable. *Output port: Only output1 can support CEC function, output 2~8 support IR extension function.